Entrance Fee: There are no entrance fees for entering the temple. But to perform special religious offerings you will be charged accordingly. Visiting Time: The temple is open on all days from 0430 – 1200 hours and 1500 – 2100 hours. Between 1200-1500 hours special programs take place which include aarti, kirtan and prasadam. Visiting Duration: The entire temple can be visited in a span of 2-3 hours. But usually the ardent devotees stay back to stay in the auspicious presence of Lord Krishna. 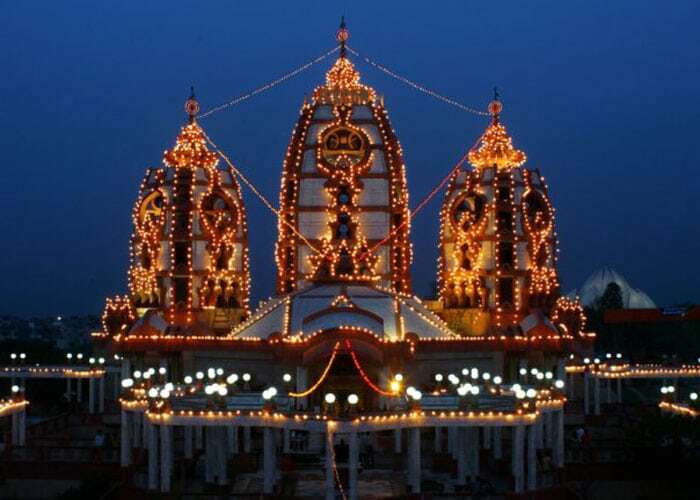 This iconic Vaishnav Temple is a popular attraction in New Delhi. The main deity of the temple is the much-loved God, Shri Krishna. This makes it one of the most visited places in New Delhi. It is one of the most beautiful and largest temple complexes in New Delhi. The temple is lavishly decorated by Russian artists and various idols. The amazing temple view will leave you stunned and speechless. It represents a very unique form of architecture that will leave you spellbound for the remainder of the trip. This temple is built by the International Society for Krishna Consciousness. One of its main purposes is to spread the knowledge of Vedic philosophy and Bhagwat Gita. Since it is a religious place it is suggested that you wear decent clothing. Remember to not hurt the people’s sentimentalities that are linked to this place by any unconscious act. Be careful about temple timings to ensure that your trip goes smoothly. Photography is not allowed in this place. You will not be allowed to carry camera inside. Be careful about some of the local vendors and their dubious claims. They can fool you into buying something that is a complete waste of money. Respect the local customs that are followed in the temple. It is better to ask your hotel authorities or research them beforehand. Visit the Vedic Culture Museum and acquaint yourself with some of the golden messaged of Shrimad Bhagwat Gita, the holy book of Hindus. Explore the Ramayana Art Gallery and watch the astounding sound and light show depicting scenes from the Ramayana. Watch the Bhagwat Gita Animatronics Robot Show, in which robots narrate the philosophy of Bhagwat Gita and Ramayana. Check out the Vedic Centre for Performing Arts. You will find yourself mesmerized in the various performances by artist from all over the country. The general themes of these acts are the different scenes from Hindu Epics like Ramayana and Mahabharata. Guides are not required to visit this magnanimous temple. There are maps and directions put around to help the visitors in navigating. Also, the temple authorities are readily available to help you in this regard. It is very easy to roam around in the temple and explore its artistic sculptures. It is open throughout the year. But the best time would be in the month of September to witness the Shri Krishna Janamashtami. It is quite a regal affair and definitely worth watching! But apart from that you will always find the temple a pleasing sight to watch. If you don’t have a vehicle of your own, it is advised you use the Delhi metro. The closest metro station would be the Nehru Place station. It is very well connected by taxis and buses too. In fact, the IGI airport is a mere 20 km from the temple. This beautiful temple located at Hare Krishna Hill, is dedicated to Lord Krishna and his love Radha. It is considered a very auspicious place. Lakhs of people visit it every year especially during festival times, to take the blessings of Lord Krishna. 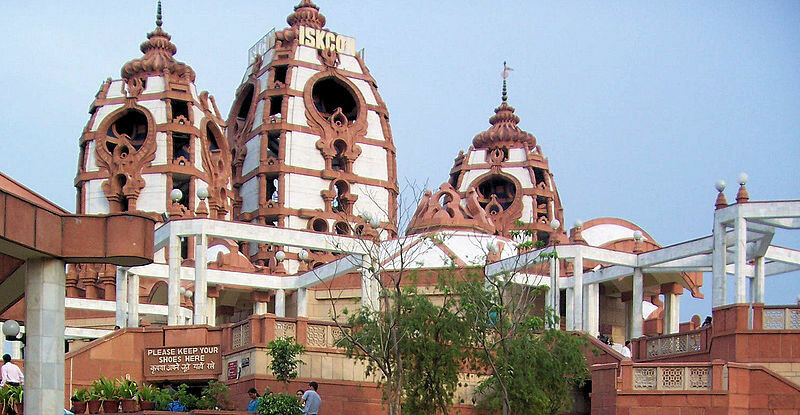 ISKCON Delhi is one among the 40 unique temples built to promote Lord Krishna’s message. Each of these temples are distinct in their own way! It is considered to be a very memorable experience to attend the Janmashtamy ceremony. ISKCON Temple, Delhi is one of the most brilliant and beautifully designed temples! People regularly go there to do some soul searching and to find some serenity in their lives. The environment of the temple is very peaceful in nature. You should definitely visit this temple, perhaps you will find your moment of tranquility in these corridors!